A more typical water care option, the Monarch® CD ozone water care system is virtually chlorine-free. It reduces the need for hot tub chemicals by continuously mixing highly concentrated ozone into the water in combination with MPS (monopersulfate), a non-chlorine oxidizer and silver ions. The Monarch CD ozone system continuously mixes highly concentrated ozone into the water as it travels through a specially designed contact chamber. Contaminants are instantly oxidized, helping to keep your spa water fresh, clean and clear. 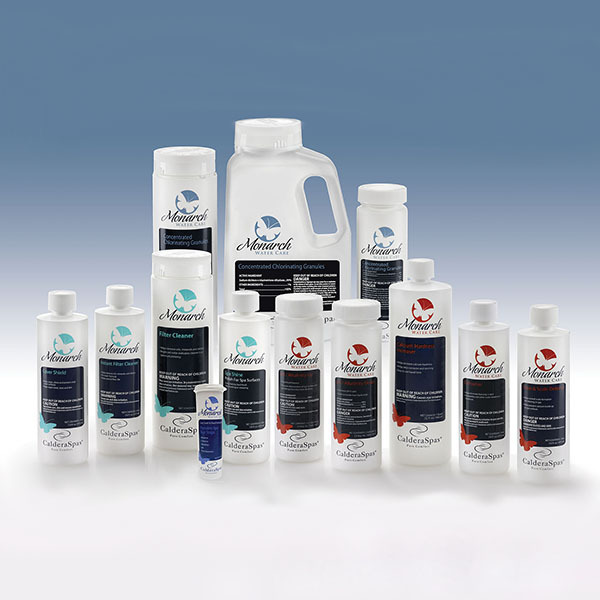 MPS is a non-chlorine oxidizer that is used with the Monarch CD ozone system and silver cartridge to help maintain sparkling clean water in your Caldera hot tub. Monarch MPS Plus is a non-chlorine oxidizer with aromatherapy. It helps keep spa water crystal-clear, and enhances your hot tub experience with pleasing scents, all in one convenient hot tub chemical product. Use these test strips to monitor your spa's MPS, pH, and alkalinity levels when using the MPS chlorine-free oxidizer.